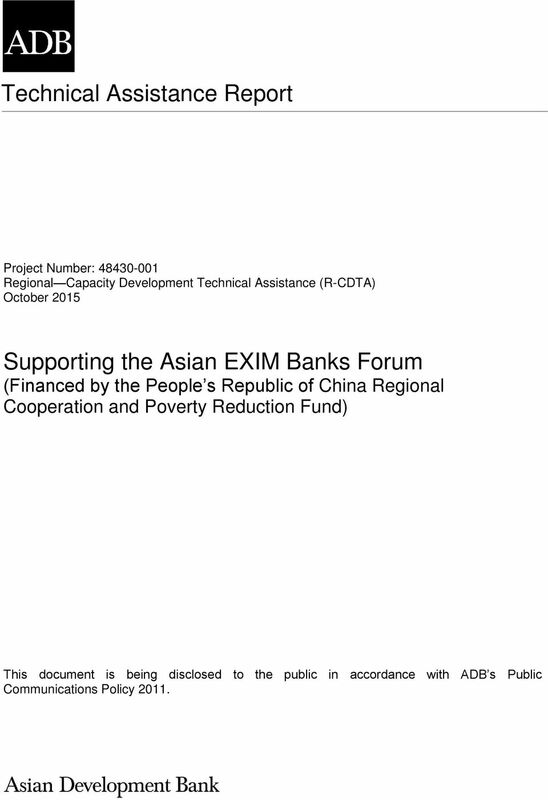 Download "Supporting the Asian EXIM Banks Forum"
1 Technical Assistance Report Project Number: Regional Capacity Development Technical Assistance (R-CDTA) October 2015 Supporting the Asian EXIM Banks Forum (Financed by the People s Republic of China Regional Cooperation and Poverty Reduction Fund) This document is being disclosed to the public in accordance with ADB s Public Communications Policy The views expressed herein are those of the consultant and do not necessarily represent those of ADB s members, Board of Directors, Management, or staff, and may be preliminary in nature. 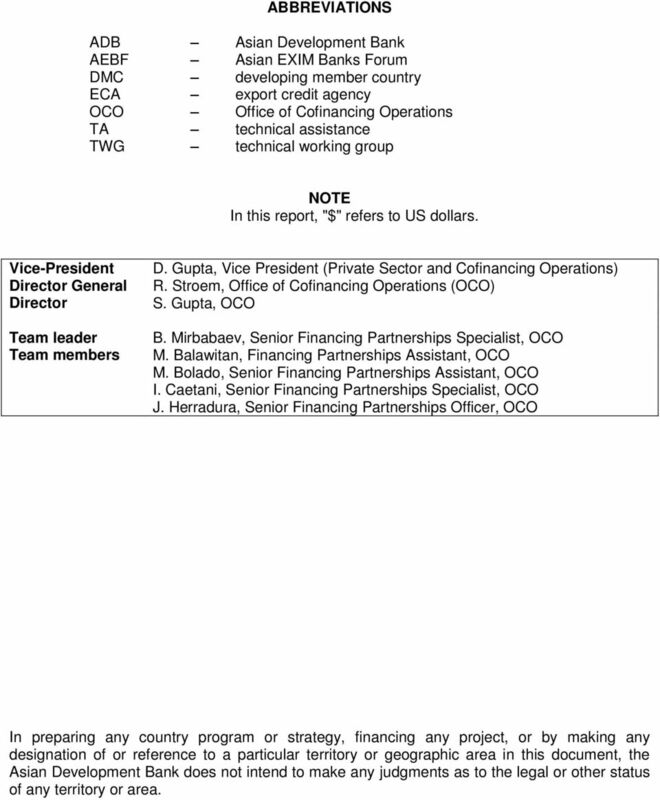 2 ABBREVIATIONS ADB Asian Development Bank AEBF Asian EXIM Banks Forum DMC developing member country ECA export credit agency OCO Office of Cofinancing Operations TA technical assistance TWG technical working group NOTE In this report, "$" refers to US dollars. Vice-President Director General Director Team leader Team members D. Gupta, Vice President (Private Sector and Cofinancing Operations) R. Stroem, Office of Cofinancing Operations (OCO) S. Gupta, OCO B. Mirbabaev, Senior Financing Partnerships Specialist, OCO M. Balawitan, Financing Partnerships Assistant, OCO M. Bolado, Senior Financing Partnerships Assistant, OCO I. Caetani, Senior Financing Partnerships Specialist, OCO J. Herradura, Senior Financing Partnerships Officer, OCO In preparing any country program or strategy, financing any project, or by making any designation of or reference to a particular territory or geographic area in this document, the Asian Development Bank does not intend to make any judgments as to the legal or other status of any territory or area. 5 I. INTRODUCTION 1. A number of Asian export-import banks and export credit agencies (ECAs) were created during the course of the economic development of many Asian countries in line with the export strategies of their respective governments. Over the years, these Asian export-import banks and ECAs have evolved into widely differing financial institutions depending upon the business environment in the respective countries, their foreign trade profiles, country risk considerations, and the development tracks of local financial markets. To develop and enhance regional cooperation, forge stronger links among these institutions, and exchange information and share ideas in a structured manner, a first meeting was held in 1996 in India at the initiative of the Export-Import Bank of India, and this led to the formation of the Asian EXIM Banks Forum (AEBF). 2. The seven initial participants were export-import banks and ECAs from Australia, the People s Republic of China, India, Japan, the Republic of Korea, Malaysia, and Thailand. Subsequently, Indonesia, the Philippines, and Viet Nam joined the AEBF, resulting in a total of 10 AEBF member countries, followed by Cambodia as an observer. 3. 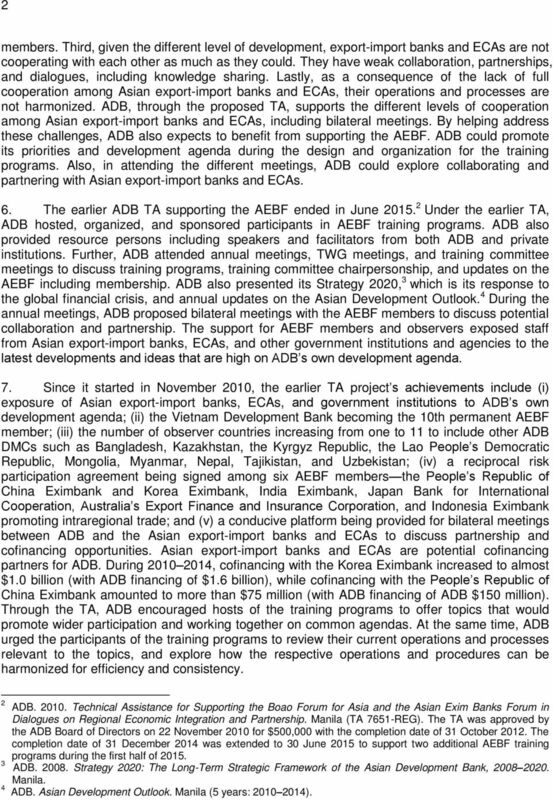 The Asian Development Bank (ADB) first became involved in the AEBF when ADB hosted the 9th AEBF Annual Meeting at ADB headquarters in November Since then, ADB has been invited as a permanent observer at AEBF annual meetings and its technical working group (TWG) and training committee meetings. ADB's role is to help design and organize AEBF conferences, seminars, and workshops, as well as to provide technical advice and resource persons. In this role, ADB has provided financial support for the training participation of selected Asian export-import banks, ECAs, and government staff, and sponsored ADB and external experts as resource persons on specific areas. 4. The proposed technical assistance (TA) will help train and increase the capacity of AEBF members and observers on the training curriculums from October 2015 to October 2018, resulting in stronger partnerships and collaboration among these institutions and regional expansion for the AEBF. The design and monitoring framework is in Appendix 1. 1 II. ISSUES 5. The proposed TA will help address the actual and growing challenges faced by the Asian export-import banks and ECAs and those within the AEBF. First, there is a lack of knowledge and capacity of staff in Asian export-import banks and ECAs for business practices in different areas. Therefore, a conducive and sound platform for knowledge sharing by way of training programs is needed to learn best practices in areas as diverse as project financing, capital markets, small and medium-sized enterprise financing, and cross-border investment. ADB can support this as it has facilities that are designed for workshops and training programs and staff who are experienced in designing and organizing training programs. Further, ADB has expert staff eligible to be resource persons for the training programs. Moreover, ADB s wide network and cooperation with institutions will bring diverse knowledge and ideas to the discussions. Second, some countries in Asia have yet to establish their export-import banks and/or ECAs. ADB s engagement in the AEBF enables increased participation from its developing member countries (DMCs). ADB and the AEBF encourage Asian countries to establish their export-import banks and/or ECAs and become observers and eventually AEBF 1 The TA first appeared in the business opportunities section of ADB s website on 15 September 2015. 6 2 members. Third, given the different level of development, export-import banks and ECAs are not cooperating with each other as much as they could. They have weak collaboration, partnerships, and dialogues, including knowledge sharing. Lastly, as a consequence of the lack of full cooperation among Asian export-import banks and ECAs, their operations and processes are not harmonized. ADB, through the proposed TA, supports the different levels of cooperation among Asian export-import banks and ECAs, including bilateral meetings. By helping address these challenges, ADB also expects to benefit from supporting the AEBF. ADB could promote its priorities and development agenda during the design and organization for the training programs. Also, in attending the different meetings, ADB could explore collaborating and partnering with Asian export-import banks and ECAs. 6. The earlier ADB TA supporting the AEBF ended in June Under the earlier TA, ADB hosted, organized, and sponsored participants in AEBF training programs. ADB also provided resource persons including speakers and facilitators from both ADB and private institutions. Further, ADB attended annual meetings, TWG meetings, and training committee meetings to discuss training programs, training committee chairpersonship, and updates on the AEBF including membership. ADB also presented its Strategy 2020, 3 which is its response to the global financial crisis, and annual updates on the Asian Development Outlook. 4 During the annual meetings, ADB proposed bilateral meetings with the AEBF members to discuss potential collaboration and partnership. The support for AEBF members and observers exposed staff from Asian export-import banks, ECAs, and other government institutions and agencies to the latest developments and ideas that are high on ADB s own development agenda. 7. Since it started in November 2010, the earlier TA project s achievements include (i) exposure of Asian export-import banks, ECAs, and government institutions to ADB s own development agenda; (ii) the Vietnam Development Bank becoming the 10th permanent AEBF member; (iii) the number of observer countries increasing from one to 11 to include other ADB DMCs such as Bangladesh, Kazakhstan, the Kyrgyz Republic, the Lao People s Democratic Republic, Mongolia, Myanmar, Nepal, Tajikistan, and Uzbekistan; (iv) a reciprocal risk participation agreement being signed among six AEBF members the People s Republic of China Eximbank and Korea Eximbank, India Eximbank, Japan Bank for International Cooperation, Australia s Export Finance and Insurance Corporation, and Indonesia Eximbank promoting intraregional trade; and (v) a conducive platform being provided for bilateral meetings between ADB and the Asian export-import banks and ECAs to discuss partnership and cofinancing opportunities. Asian export-import banks and ECAs are potential cofinancing partners for ADB. During , cofinancing with the Korea Eximbank increased to almost $1.0 billion (with ADB financing of $1.6 billion), while cofinancing with the People s Republic of China Eximbank amounted to more than $75 million (with ADB financing of ADB $150 million). Through the TA, ADB encouraged hosts of the training programs to offer topics that would promote wider participation and working together on common agendas. At the same time, ADB urged the participants of the training programs to review their current operations and processes relevant to the topics, and explore how the respective operations and procedures can be harmonized for efficiency and consistency. 2 ADB Technical Assistance for Supporting the Boao Forum for Asia and the Asian Exim Banks Forum in Dialogues on Regional Economic Integration and Partnership. Manila (TA 7651-REG). The TA was approved by the ADB Board of Directors on 22 November 2010 for $500,000 with the completion date of 31 October The completion date of 31 December 2014 was extended to 30 June 2015 to support two additional AEBF training programs during the first half of ADB Strategy 2020: The Long-Term Strategic Framework of the Asian Development Bank, Manila. 4 ADB. Asian Development Outlook. Manila (5 years: ). 7 3 8. Finally, through the earlier TA, ADB has supported a total of 14 AEBF training programs on topics including public finance, project and trade finance, public private partnership finance, private and finance sector development, cofinancing structuring, loan syndication, risk management, credit ratings, and securities and cross-border collaterals. III. THE CAPACITY DEVELOPMENT TECHNICAL ASSISTANCE A. Impact and Outcome 9. 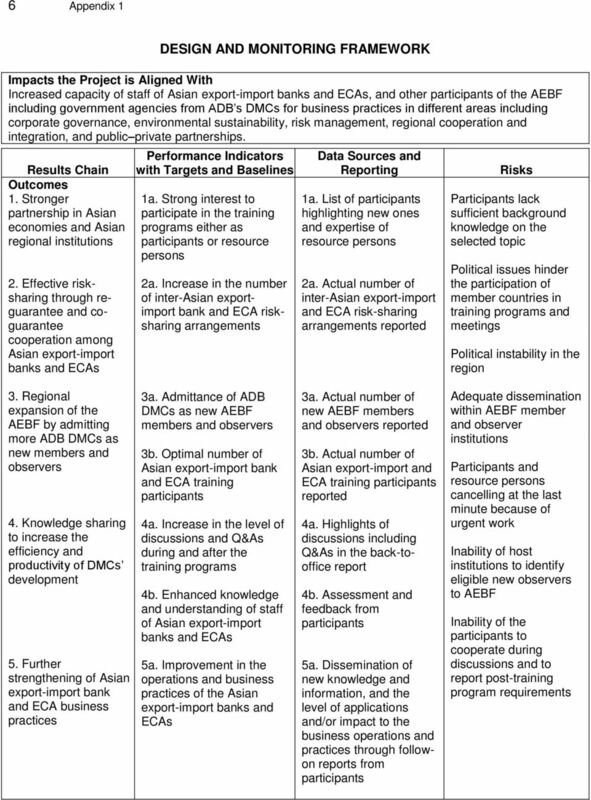 The impact will be increased capacities among staff in Asian export-import banks and ECAs and other AEBF participants including government agencies from ADB s DMCs for business practices in corporate governance, environmental sustainability, risk management, regional cooperation and integration, and public private partnerships. The outcomes will be (i) stronger partnerships among Asian economies and Asian regional institutions; (ii) effective risksharing through reguarantee and coguarantee cooperation among Asian export-import banks and ECAs, giving them an additional level of comfort when doing business in challenging markets; (iii) regional expansion for the AEBF aiming at ADB s DMCs; (iv) knowledge sharing to increase the efficiency and productivity of DMC development; and (v) further strengthening the business practices of Asian export-import banks and ECAs. B. Methodology and Key Activities 10. The TA outputs include client-oriented and high-quality AEBF training programs, support to the different activities of the AEBF, and cofinancing possibilities between the Asian exportimport banks and ADB. ADB will actively participate in the design and delivery of AEBF training programs and workshops through the use of experts, resource persons, and workshop coordinators and facilitators. They will help implement these training programs and workshops. ADB may also host training programs and workshops on request from AEBF members. 11. 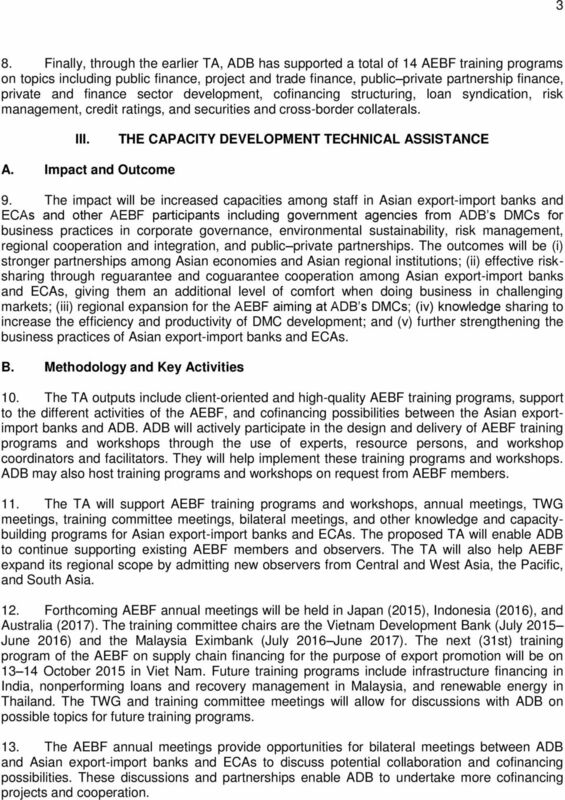 The TA will support AEBF training programs and workshops, annual meetings, TWG meetings, training committee meetings, bilateral meetings, and other knowledge and capacitybuilding programs for Asian export-import banks and ECAs. 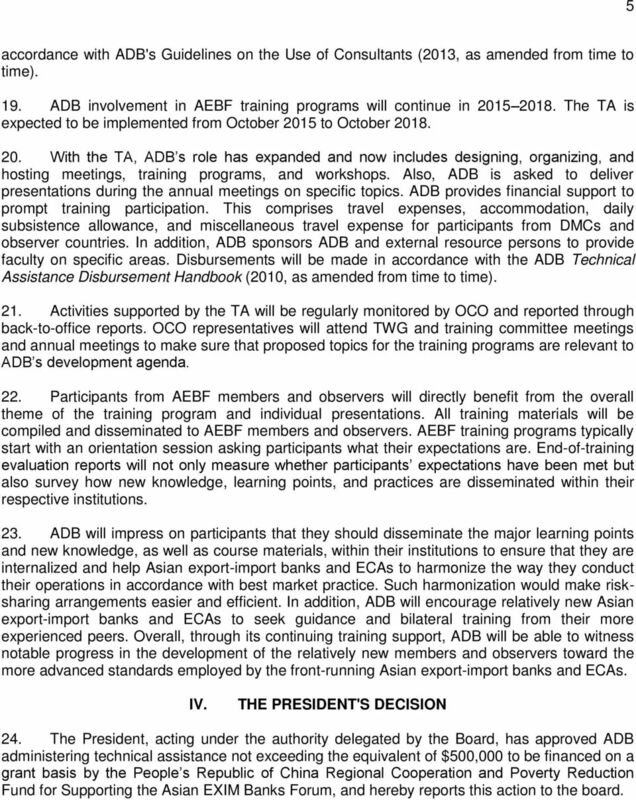 The proposed TA will enable ADB to continue supporting existing AEBF members and observers. The TA will also help AEBF expand its regional scope by admitting new observers from Central and West Asia, the Pacific, and South Asia. 12. Forthcoming AEBF annual meetings will be held in Japan (2015), Indonesia (2016), and Australia (2017). The training committee chairs are the Vietnam Development Bank (July 2015 June 2016) and the Malaysia Eximbank (July 2016 June 2017). The next (31st) training program of the AEBF on supply chain financing for the purpose of export promotion will be on October 2015 in Viet Nam. Future training programs include infrastructure financing in India, nonperforming loans and recovery management in Malaysia, and renewable energy in Thailand. The TWG and training committee meetings will allow for discussions with ADB on possible topics for future training programs. 13. The AEBF annual meetings provide opportunities for bilateral meetings between ADB and Asian export-import banks and ECAs to discuss potential collaboration and cofinancing possibilities. These discussions and partnerships enable ADB to undertake more cofinancing projects and cooperation. 8 4 14. Based on the outputs and activities above, major assumptions of the TA are sustained commitment from AEBF member countries, observers, the host AEBF member country, and resource persons. One potential risk is regional political instability that may hinder country participation. The requested funding support under this TA will allow ADB to accommodate the training needs from the envisaged expansion of the AEBF s regional scope. While the AEBF welcomes new observers, a potential risk may be the inability to identify eligible new observers by the host AEBF member country and governments without export-import banks and/or ECAs yet. C. Cost and Financing 15. The TA is estimated to cost $500,000 and will be financed on a grant basis by the People s Republic of China Regional Cooperation and Poverty Reduction Fund and administered by ADB. 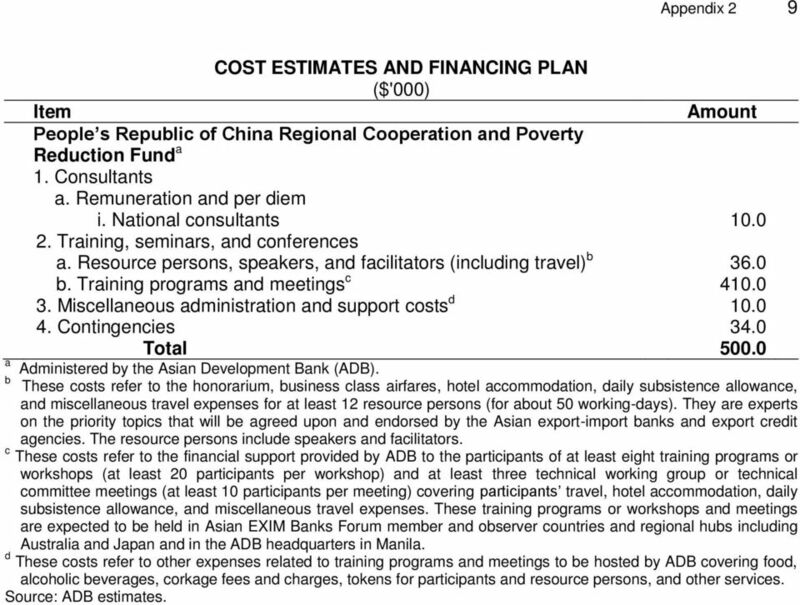 The breakdown of costs includes remuneration for two national consultants (total of $10,000), related expenses for resource persons including travel ($36,000), financial support to participants (i.e., travel, hotel accommodation, daily subsistence allowance, and miscellaneous travel expense of nominated participants from the eligible AEBF members and observers, and from potential new eligible AEBF observers), related expenses for ADBhosted training programs, and contingencies. The cost estimates and financing plan are in Appendix 2. D. Implementation Arrangements 16. ADB will execute the TA, with the Office of Cofinancing Operations (OCO) as focal point, and with the host AEBF members and/or observers as the lead for the training programs. 5 ADB will coordinate with AEBF members and observers, and decide on training topics to be supported during the annual AEBF TWG and training committee meetings. 17. ADB will help in the design and delivery of the programs and support arrangements for the AEBF annual meetings, TWG and training committee meetings, and bilateral meetings with AEBF members and observers. The hosts and training committee chairs for the AEBF meetings and training programs are expected to decide on the overall themes, logistics, and protocol. ADB will, from its perspective as a sponsor, elect to propose and support topics that are high on its own development agenda while catering for the needs of AEBF members and observers based on new market developments. 18. OCO will seek and engage a total of at least 12 potential resource persons for 50 working-days from ADB and institutions including the private sector to present and run workshops during the trainings. 6 This will be achieved through early discussions with the potential speakers on specific topics. ADB departments and offices will be invited to participate in the training programs ADB hosts at its headquarters. At the same time, OCO will seek and engage two national consultants (5 person-months each) for the two expected ADB-hosted training programs at ADB headquarters in Manila. The consultants will be engaged in 5 OCO has been leading this TA for the following reasons: (i) ADB as a permanent observer was represented by OCO on the institutional level at AEBF annual, TWG, and training committee meetings; (ii) OCO retained the responsibility for ADB's partnership with the ECAs; (iii) leading AEBF members, e.g., the Korean Eximbank and the People s Republic of China Eximbank, are active official ADB cofinancing partners; and (iv) the TA supports various sectors and topics, which can be fully facilitated by OCO. 6 The travel cost of ADB staff will be covered by the TA in accordance with Budget, Personnel, and Management Systems Department and Strategy and Policy Department memorandum of 26 June 2013 (Use of Bank Resources: Regional technical assistance and TA versus Internal Administrative Expenses Budget). 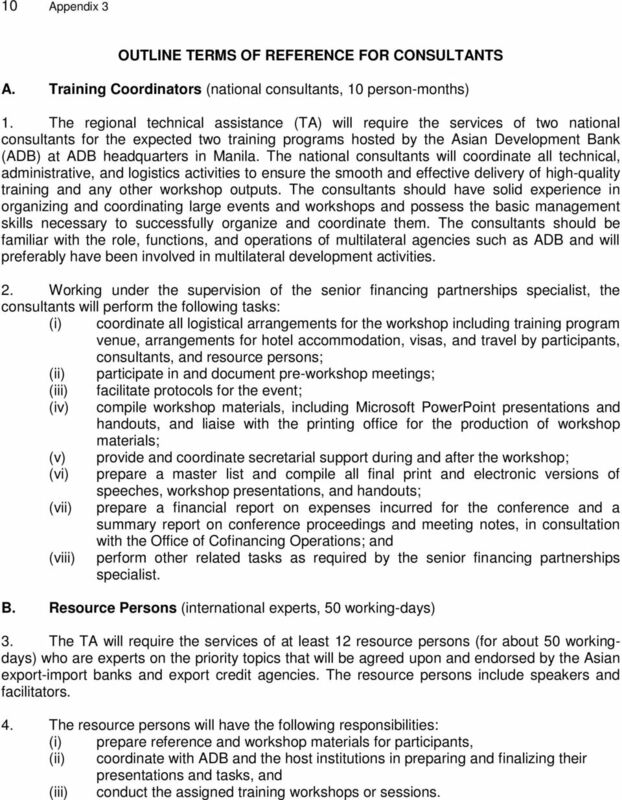 9 5 accordance with ADB's Guidelines on the Use of Consultants (2013, as amended from time to time). 19. 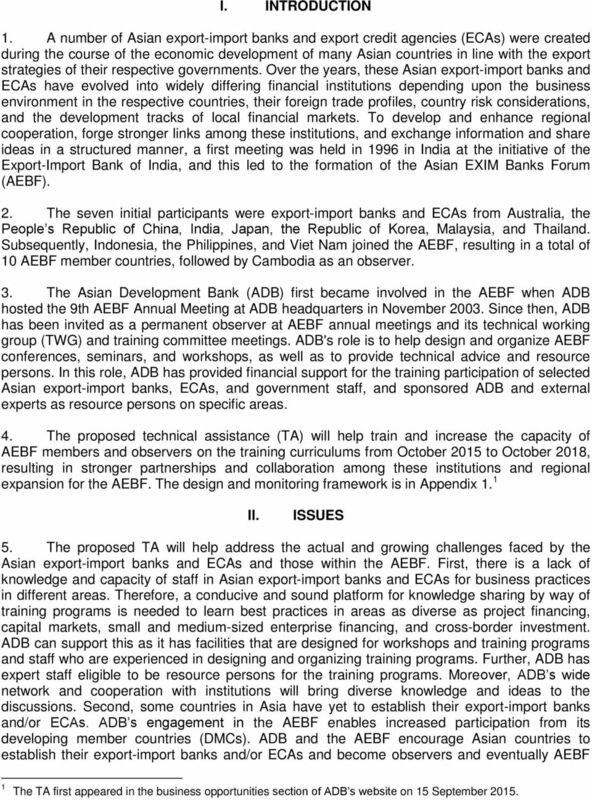 ADB involvement in AEBF training programs will continue in The TA is expected to be implemented from October 2015 to October With the TA, ADB s role has expanded and now includes designing, organizing, and hosting meetings, training programs, and workshops. Also, ADB is asked to deliver presentations during the annual meetings on specific topics. ADB provides financial support to prompt training participation. This comprises travel expenses, accommodation, daily subsistence allowance, and miscellaneous travel expense for participants from DMCs and observer countries. In addition, ADB sponsors ADB and external resource persons to provide faculty on specific areas. Disbursements will be made in accordance with the ADB Technical Assistance Disbursement Handbook (2010, as amended from time to time). 21. Activities supported by the TA will be regularly monitored by OCO and reported through back-to-office reports. OCO representatives will attend TWG and training committee meetings and annual meetings to make sure that proposed topics for the training programs are relevant to ADB s development agenda. 22. Participants from AEBF members and observers will directly benefit from the overall theme of the training program and individual presentations. All training materials will be compiled and disseminated to AEBF members and observers. AEBF training programs typically start with an orientation session asking participants what their expectations are. End-of-training evaluation reports will not only measure whether participants expectations have been met but also survey how new knowledge, learning points, and practices are disseminated within their respective institutions. 23. ADB will impress on participants that they should disseminate the major learning points and new knowledge, as well as course materials, within their institutions to ensure that they are internalized and help Asian export-import banks and ECAs to harmonize the way they conduct their operations in accordance with best market practice. Such harmonization would make risksharing arrangements easier and efficient. In addition, ADB will encourage relatively new Asian export-import banks and ECAs to seek guidance and bilateral training from their more experienced peers. Overall, through its continuing training support, ADB will be able to witness notable progress in the development of the relatively new members and observers toward the more advanced standards employed by the front-running Asian export-import banks and ECAs. IV. THE PRESIDENT'S DECISION 24. The President, acting under the authority delegated by the Board, has approved ADB administering technical assistance not exceeding the equivalent of $500,000 to be financed on a grant basis by the People s Republic of China Regional Cooperation and Poverty Reduction Fund for Supporting the Asian EXIM Banks Forum, and hereby reports this action to the board. 12 8 Appendix 1 Key Activities with Milestones 1.1 At least three plenary consultations with Asian export-import banks and ECAs during the annual training committee and TWG meetings, and ad hoc consultations with each hosting Asian exportimport bank and ECA as applicable 1.2 Selection and engagement of national consultants and resource persons, as necessary, for each of the 8 11 AEBF conferences, seminars, meetings, workshops, and/or training programs in Q Q (Appendix 3) 1.3 Holding of at least 8 11 AEBF conferences, seminars, meetings, workshops, and/or training programs including at ADB headquarters in Manila and other AEBF member or observer headquarters or regional hubs (e.g., Hong Kong, China; the People s Republic of China; Singapore; and the Republic of Korea) in Q Q Evaluation of training course by participants for each of the 8 11 AEBF conferences, seminars, meetings, workshops, and/or training programs in Q Q Compilation and distribution of training materials to AEBF members and observers via participants and AEBF website maintained and updated by India Eximbank after each of the 8 11 AEBF conferences, seminars, meetings, workshops, and/or training programs in Q Q Regional expansion of AEBF by admitting more ADB DMCs as new observers and members Inputs People s Republic of China Regional Cooperation and Poverty Reduction Fund: $500,000 Assumptions for Partner Financing Not applicable. 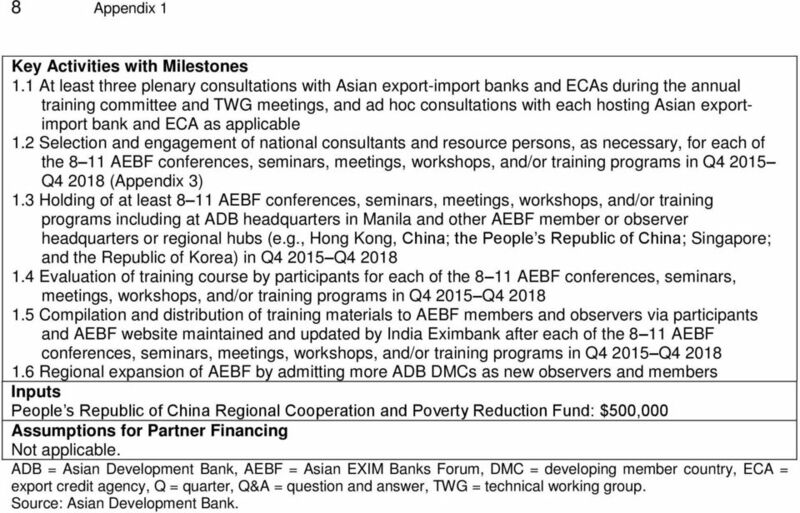 ADB = Asian Development Bank, AEBF = Asian EXIM Banks Forum, DMC = developing member country, ECA = export credit agency, Q = quarter, Q&A = question and answer, TWG = technical working group. Source: Asian Development Bank. 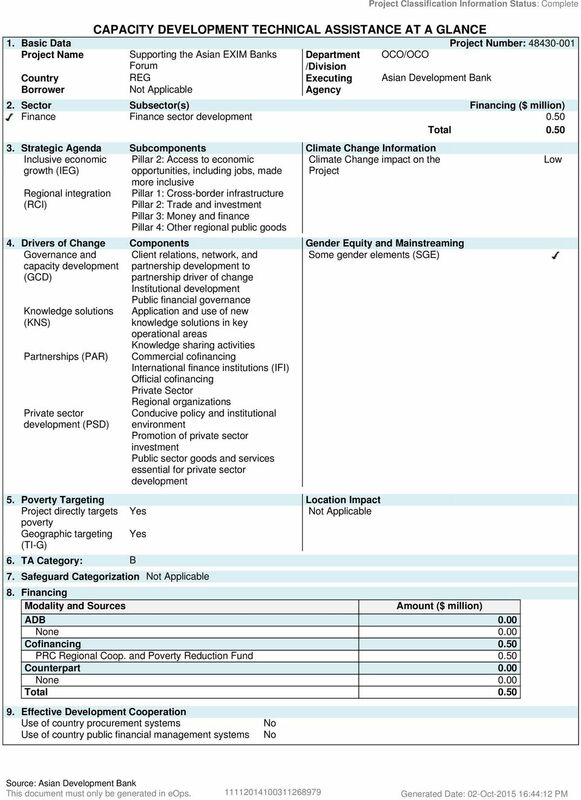 13 Appendix 2 9 a COST ESTIMATES AND FINANCING PLAN ($'000) Item Amount People s Republic of China Regional Cooperation and Poverty Reduction Fund a 1. Consultants a. Remuneration and per diem i. National consultants Training, seminars, and conferences a. Resource persons, speakers, and facilitators (including travel) b 36.0 b. 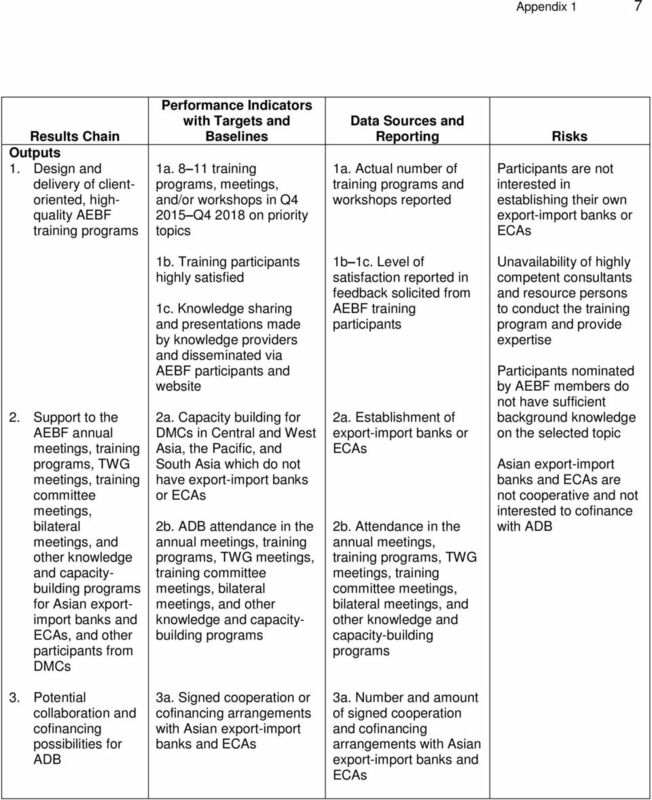 Training programs and meetings c Miscellaneous administration and support costs d Contingencies 34.0 Total Administered by the Asian Development Bank (ADB). b These costs refer to the honorarium, business class airfares, hotel accommodation, daily subsistence allowance, and miscellaneous travel expenses for at least 12 resource persons (for about 50 working-days). They are experts on the priority topics that will be agreed upon and endorsed by the Asian export-import banks and export credit agencies. The resource persons include speakers and facilitators. c These costs refer to the financial support provided by ADB to the participants of at least eight training programs or workshops (at least 20 participants per workshop) and at least three technical working group or technical committee meetings (at least 10 participants per meeting) covering participants travel, hotel accommodation, daily subsistence allowance, and miscellaneous travel expenses. These training programs or workshops and meetings are expected to be held in Asian EXIM Banks Forum member and observer countries and regional hubs including Australia and Japan and in the ADB headquarters in Manila. 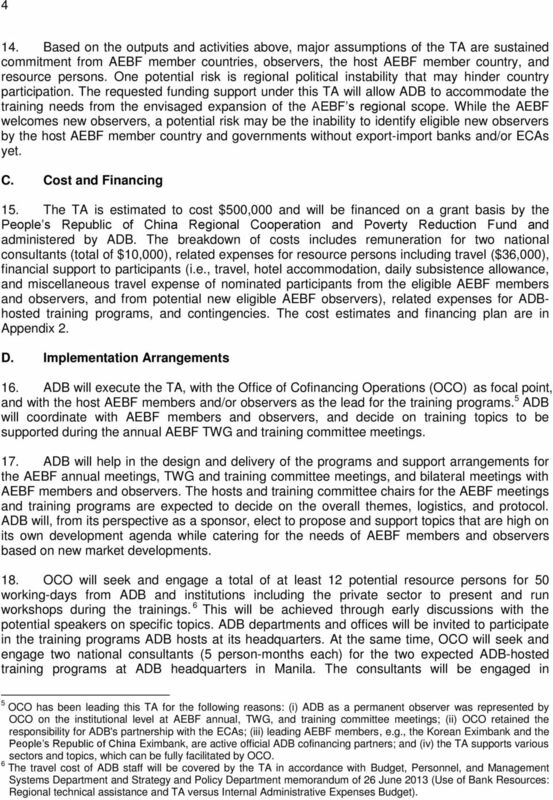 d These costs refer to other expenses related to training programs and meetings to be hosted by ADB covering food, alcoholic beverages, corkage fees and charges, tokens for participants and resource persons, and other services. Source: ADB estimates. 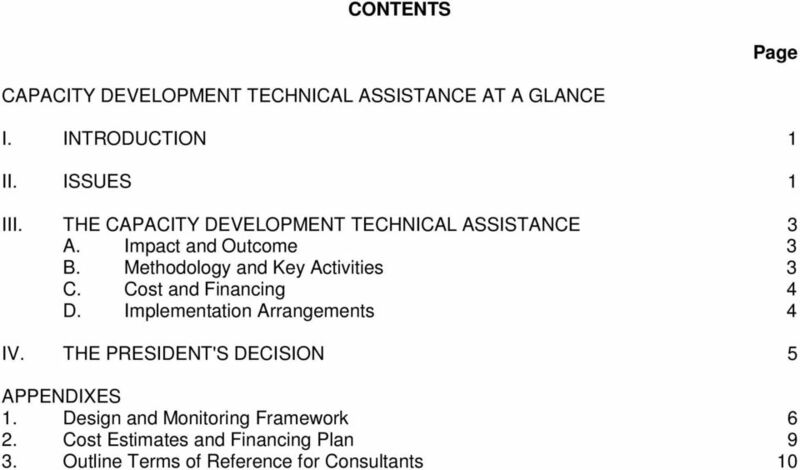 14 10 Appendix 3 OUTLINE TERMS OF REFERENCE FOR CONSULTANTS A. Training Coordinators (national consultants, 10 person-months) 1. The regional technical assistance (TA) will require the services of two national consultants for the expected two training programs hosted by the Asian Development Bank (ADB) at ADB headquarters in Manila. The national consultants will coordinate all technical, administrative, and logistics activities to ensure the smooth and effective delivery of high-quality training and any other workshop outputs. The consultants should have solid experience in organizing and coordinating large events and workshops and possess the basic management skills necessary to successfully organize and coordinate them. The consultants should be familiar with the role, functions, and operations of multilateral agencies such as ADB and will preferably have been involved in multilateral development activities. 2. Working under the supervision of the senior financing partnerships specialist, the consultants will perform the following tasks: (i) coordinate all logistical arrangements for the workshop including training program venue, arrangements for hotel accommodation, visas, and travel by participants, consultants, and resource persons; (ii) participate in and document pre-workshop meetings; (iii) facilitate protocols for the event; (iv) compile workshop materials, including Microsoft PowerPoint presentations and handouts, and liaise with the printing office for the production of workshop materials; (v) provide and coordinate secretarial support during and after the workshop; (vi) prepare a master list and compile all final print and electronic versions of speeches, workshop presentations, and handouts; (vii) prepare a financial report on expenses incurred for the conference and a summary report on conference proceedings and meeting notes, in consultation with the Office of Cofinancing Operations; and (viii) perform other related tasks as required by the senior financing partnerships specialist. B. Resource Persons (international experts, 50 working-days) 3. The TA will require the services of at least 12 resource persons (for about 50 workingdays) who are experts on the priority topics that will be agreed upon and endorsed by the Asian export-import banks and export credit agencies. The resource persons include speakers and facilitators. 4. The resource persons will have the following responsibilities: (i) prepare reference and workshop materials for participants, (ii) coordinate with ADB and the host institutions in preparing and finalizing their presentations and tasks, and (iii) conduct the assigned training workshops or sessions.